Bradley Beal Capped off a Wizards Victory with a 42 Point Career High against the Suns. If the Wizards can lean on one player this season to get things done, it has been Bradley Beal and tonight his career high 42 pointed that keyed a Wizards victory, 106-101 in the final minute of the game. “He can be one of the best two-way players in the league, and my job is to continue to push him to strive for greatness,” Wizards Head Coach Scott Brooks said. 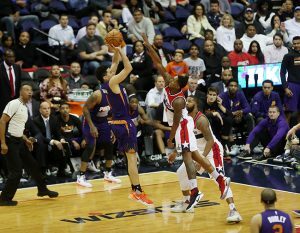 Devin Booker had 30 points and Eric Bledsoe scored 29 for Phoenix (4-11), which has lost five of six. Booker and Bledsoe scored 18 of the team’s 21 points in the fourth quarter. Washington’s Otto Porter left with about 7 minutes to play in the third quarter and did not return. Porter, who finished with nine points, was diagnosed with inflammation in his right hip. Brooks said Porter was day to day. Wizards Fall to 0-3 in Summer League Play, What’s Next for this Roster Come Training Camp?